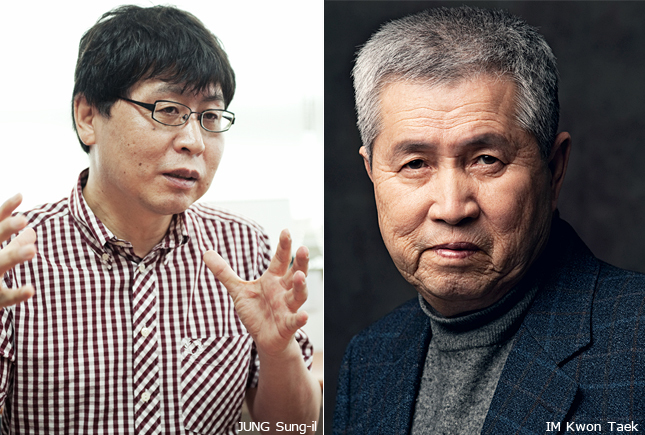 While it seems that in-depth film reviews have all but disappeared these days, the film critic JUNG Sung-il is going to shed new light on IM Kwon-taek’s films with his professional and sharp insights. The Korean Film Archive is going to introduce a new section called the ‘KMDb Expert Column’ on the Korean Movie Database website (KMDb, www.kmdb.or.kr) and start posting JUNG’s reviews of IM’s filmography under the title ‘IM Kwon Taek × 101; JUNG Sung-il sheds new light on IM Kwon-taek’ starting November 6th. Since his debut with Farewell Duman River in 1962, he has never rested for 50 years, right through to his 101st film Hanji, released in 2010, and seemingly he won’t. As the films he made in the 1980s and later such as Mandara (1981), The Surrogate Womb (1986), Aje Aje Bara Aje (1989) and Sopyonje (1993) were highlighted at international film festivals, he gained the title as ‘The Most Korean Director’. In this feature, starting on November 6th, JUNG will post professional film reviews of IM’s films, which he has had much interest in and affection towards. Out of 101 films directed by IM, 71 films stored at the Korean Film Archive will be reviewed. By updating a new piece every other week, the section will go on for 2 years. After starting with the prologue, JUNG will post reviews of Hanji followed by Farewell Duman River. Then the rest of the films will be reviewed in random order. JUNG worked as the chief editor of the film magazines ‘Road Show’ and ‘Kino’, and as a programmer at the Jeonju International Film Festival (JIFF) before he taught students at the Korean Academy of Film Arts (KAFA) and Korea National University of Arts. His debut as a director was Cafe Noir.